A 44 year old man known with hypertension was brought by ambulance to the emergency department because of sudden onset increasing signs of angina pectoris. Initial assessment on the ECG showed ST-elevation aVR, aVL and I, suggestive of myocardial ischemia (of the proximal LAD). An emergency coronary angiography was performed. This showed an occlusion of the proximal LAD (see white arrowhead in image below), which was treated by primary PCI (result of the PCI is seen in the second image). Maximal CK values in this patients were 8100 U/l, suggestive of a large myocardial infarction with substantial myocardial cell loss. A second elective PCI of a significant stenosis in the distal RCX (see circle in second image and result after PCI in the third image) followed a few days later. After these therapeutic interventions, images of the myocardium were obtained by echocardiography and MRI. Results and considerations will be discussed below. The global LV systolic function directly after the myocardial infarction was moderately decreased with a left ventricular ejection fraction of 38%. This was mainly due to akinesis of the apex and anteroseptal wall (see movie clips below). Also note the spontaneous contrast forming in the LV apex. These findings were confirmed by strain values and MRI imaging, as shown below. Strain imaging in the acute phase shows abnormal deformation patterns in the affected myocardial segments due to ischemia. 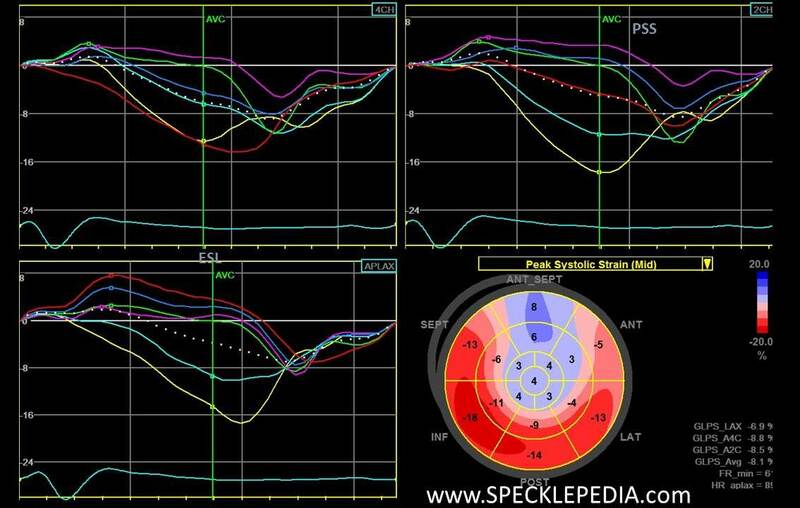 Peak systolic values are mostly reduced in the apex. 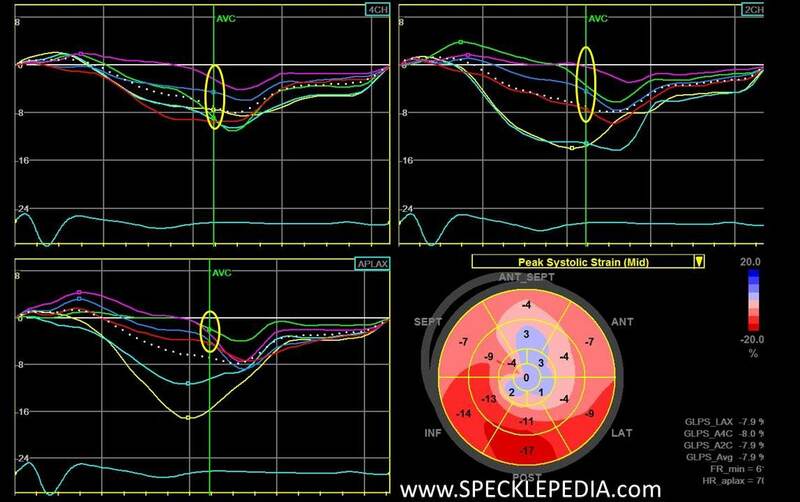 Also anterior and septal segments of the basal myocardium show a decrease in peak systolic strain (indicated by the yellow circles in the first figure). 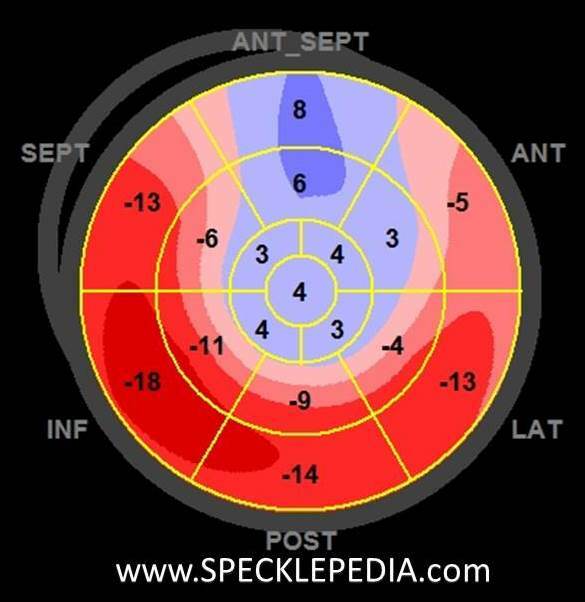 Post systolic shortening (PSS) occurs in multiple regions, but then again most evident in the apex and anterior wall (see blue arrows and bulls-eye plot in second figure). During early systole, when LV pressure rises systolic shortening will occur in healthy myocardium. Because of the reduced ability to generate active force, ischemic myocardium tends to lengthen just before systolic shortening. In the apical region there is early systolic lengthening (ESL) without signs of myocardial contraction, so this seems the most affected region in the acute phase. Global longitudinal strain (GLS) measured directly after revascularization is a strong predictor for LV ejection recovery and LV remodeling when using the cutoff values of respectively -12.9% and -12.8%. The value of GLS in the acute phase is -7.9% so this exceeds the cutoff value for LV remodeling. The following image of the defromation in the APLAX view clearly shows the different characteristics of the transmural acute myocardial infarction. Three months later the ultrasound was repeated. It showed extensive defects in apical and anteroseptal regions of the LV. These regions also showed extensive wall thinning, suggestive of transmural infarction. LVEF on 3D was 45%. Strain values obtained 3 months after PCI procedures of the proximal LAD and RCX present deformation improvement of regions surrounding the myocardial infarction. 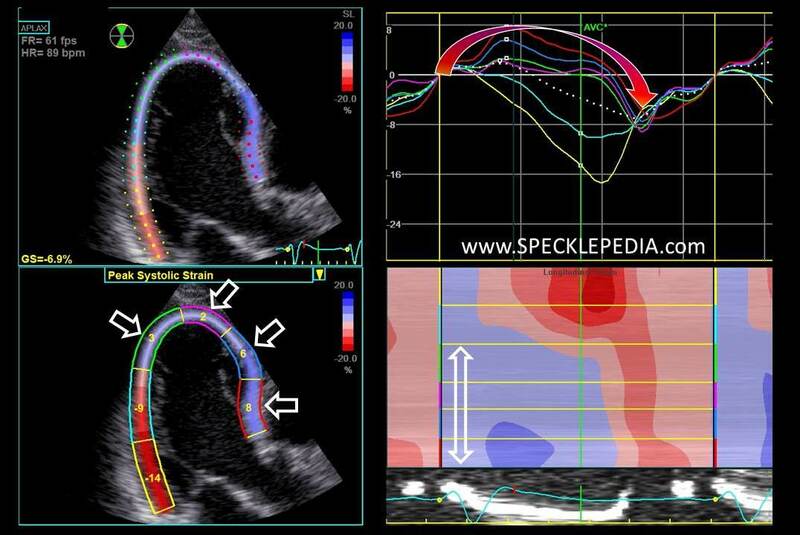 Peak systolic strain remains reduced in the apical and anterior segments, while other regions showed slightly decreased to normal values. Patterns of the post systolic shortening are similar to the acute phase. The persistent PSS in the infarcted regions reflects transmural scarring. In general, PSS assumes to reflect inhomogeneities in regional myocardial tension but there is still no consensus whether it is caused by prolonged contraction, delayed relaxation, or elastic recoil after systolic bulging. In this case there is transmural scar (see CMR below) and therefore the PSS is induced by elastic recoil. 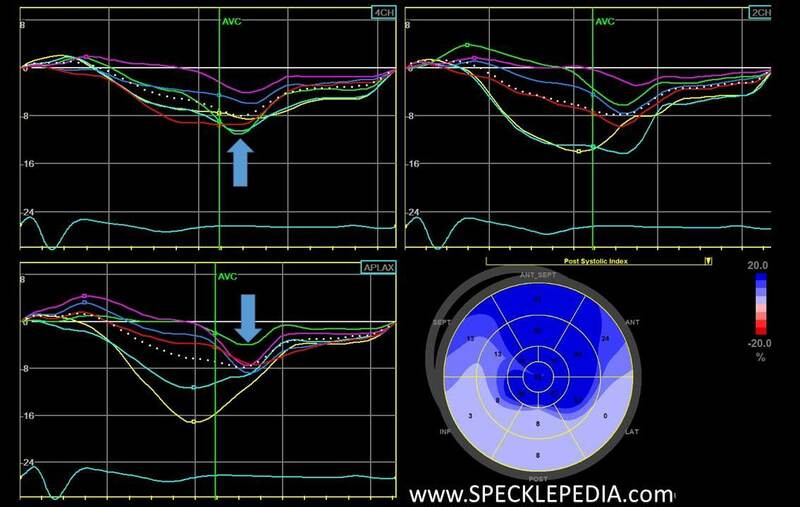 Early systolic lengthening still exists and is now more outspoken in anterior part of the septum than in apex. In this case GLS tends to be a good predictor for LV myocardial changes. The predicted LV remodeling occurs indeed with wall thinning in the apex and anteroseptal segments. This all taken together, the myocardial infarction is located in the apex and anterior region of the septum which correlates well to the areas supplied by the LAD. One month after the myocardial infarction, delayed enhancement occurred in anteroseptal and septal parts of the basal myocardial region. When comparing extend of the affected myocardium derived from MRI images with longitudinal peak systolic strain values of the different myocardial segments a relation is visible. In segments with less negative peak systolic strain the range of infarction is more transmural. 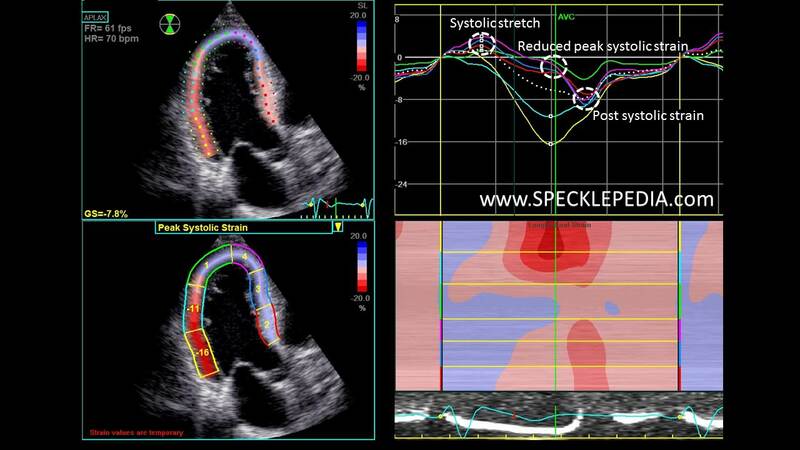 Appreciate the corresponding delayed enhancement short axis images of the LV with the corresponding segmental longitudinal peak systolic strain values. There is a very close relation between the amount of transmurality of scar and the longitudinal strain values. 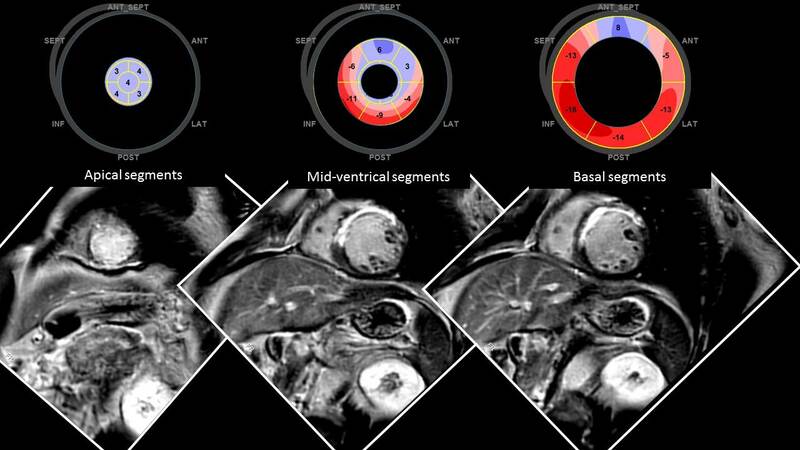 Positive strain values are exclusively seen in the segments with transmural infarction.